This article primarily deals with how to turn off a gas hot water heater. Failure to follow the proper steps may result in damage to the internal elements of the water tank. There are only a handful of steps and they are easy to follow. In most homes you have one of two types of water heaters, gas and electric. For the purposes of this discussion, propane would also be considered gas. If you have an electric hot water heater, see the article 'How To Shut Down an Electric Hot Water Heater' for instructions on this type of unit. Not sure which kind you have? There are a couple of telltale signs that make it easy to identify which style you have. For an electric water heater, the wiring coming into the top of the water heater gives it away. Also, electric water heaters do not have vents, since they do not burn anything to heat up. A gas water heater is identified by the vent at the top. This can be metal or plastic, depending on the efficiency level of your hot water heater. A gas water heater also has a gas line that attaches to the unit near the bottom. A telltale sign of a gas water heater is the gas valve and burner assembly at the bottom of the water heater. The gas valve will have a heavy metal gas pip attached to it. It will have a burner assembly below it that will be covered by a removable plate. This plate will protrude around the lower gas line and thermocouple connector. It is usually possible to see a pilot light through a window after the outer cover plate is removed. Gas water heaters use a burner that has an open flame to heat the water. Gas hot water heaters burn natural (or propane) gas to heat the water. Burning fossil fuel produces harmful gases. Therefore, a gas hot water heater will always have a vent of some kind. The type of vent depends on the efficiency of the hot water heater. Higher efficiency units will use a plastic pipe the vent through an outside wall. Lower efficiency unit will vent into a masonry or metal chimney. Electric water heaters will not have any type of venting apparatus. Of course it stands to reason that that a gas hot water heater would use natural or propane gas to operate. This type of gas is a low pressure fuel that requires a fairly large piping system for delivery. The burner assembly mentioned above will need piping connected to it. This piping will be obvious when you look at the water heater. It will be attached to the gas valve at the bottom of the unit and usually be connected on the left side when you are facing the water heater. Electric hot water heaters do not have vents. Vents are required on gas water heaters to remove toxic fumes. Electric water heaters do not generate fumes and therefore do not have a vent. Vents can be made of metal or plastic and usually go into a chimney, metal vent pipe or through an outside wall. An electric water heater will only have the water inlets and a power cable at the top of the unit. NO VENT will be present. Electric hot water heaters use heating elements to heat the water. Most of them have two elements, an upper and a lower element. The elements are behind access panels on the side of the water heater. The spacing of these panels will vary, but usually one is near the bottom and the other can be anywhere from the middle of the water heater to near the top. The panels may be a different color or the same color as the rest of the water heater housing. They are generally held in place by two screws and are easily removed. A gas water will have a gas valve and burner access panel at the bottom of the water tank only. There will not be any access panels higher up on the housing. An electric water heater will not have a gas line attached to the water heater. Gas lines are fairly heavy pipes that have large fittings on them. It is called black pipe, since it is black and oily when it is manufactured. The gas line connects at the bottom of the water tank at the gas valve. You will not see any of this on an electric water heater. (1) For working on water pipes or draining the tank, turn the gas valve control to pilot. 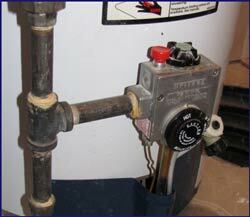 (2) For any other work on the hot water heater, turn the gas completely off. (3) Cool down the water inside of the tank. (4) Shut off the cold water supply to the hot water tank. (5) Open a hot water faucet somewhere, (preferably above) in the house. 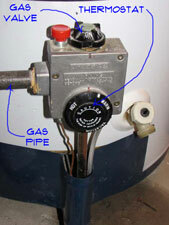 The water heater gas valve is located toward the bottom of your water heater just above the burner chamber. On the top of the gas valve that has various settings on it. The three main settings are 'OFF', 'Pilot' and 'ON'. Turning the dial to 'Pilot' will shut the gas off to the burner without shutting off the pilot light. This setting can save you the trouble of having to light the pilot again when you are done. This setting should not be used if you are doing any work on the burner assembly or the gas line. It is suitable to use when you are draining the tank or working on the water lines. The safest thing to do whenever you work on your gas hot water heater. Leaking gas can explode and is quite dangerous. First turn the dial on the gas valve to 'OFF'. Turning the gas valve to 'OFF' does not completely shut off the gas. There is a ball valve on the gas piping next to the water heater. This valve should be turned 90 degrees until the handle is perpendicular to the pipe. With the gas valve shut off, the gas is completely turned off and the water heater is safe to work on. This is an important step. Water that is directly out of the gas hot water tank can be very hot and scald or burn you. Run and considerable amount of hot water through one of the fixtures until the water is just warm. Do not mix it with cold water, run it pure hot. The cold water running into the tank will dilute the hot water and reduce the temperature. After the water has cooled down, it is safest to work on the water heater. Do not shut the water off if you have not turned the gas going into your gas hot water heater off. If the water continues to heat inside the water heater after the water is shut off the heater will build up too much pressure. If you are sure the water is off, you can turn off the cold water supply. Opening a faucet will prevent the water heater from developing an air lock. Any attempts to drain the water tank will fail if a faucet is not open to provide air. It should now be safe to work on your hot water tank. Most repairs on a gas hot water tank can be made without draining the tank. There are, however a few exceptions that must be noted. Removing or replacing a gas valve will require the tank to be drained. This part threads directly into the lower portion of the tank. Another activity that requires an empty tank is flushing out the sediment. Clearing out water heater sediment on a annual or semi-annual program is a good maintenance program. Draining the tank is a chore, but the steps required are also required for the sediment flush, so it is really not any extra work. After you have completed your repairs you are going to need to get your water heater working again. 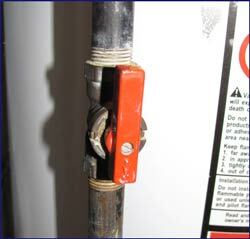 See the article, 'Starting Up a Hot Water Heater' for instructions. The steps are similar to shutting a water heater down, you just want to get them in the right order.